Yurts are traditional nomadic dwellings whose use stretches from Mongolia to Turkey, all across central Asia, that have been in use for at least three thousand years. The geographical home of the Yurt is the Asian Steppe. The use of the Yurt expanded in the brutally prolific expansion of the Mongol Empire in the 12th and 13th Centuries, over the whole of Central Asia, stretching from Eastern Turkey far into China. Words for Yurt translate as home, felt home and white home, and include names such as ‘Ger’ in Mongolian, ‘Kozuy’ in Kazakh, ‘Bozuy’ in Kyrgyz, ‘Akoy’, ‘Quarauy’, ‘Kherga’ ,’Tirma’, and ‘Keymah’. The diversity of the languages in which they have been named in reflects the array of tribal cultures and the massive geographic area over which they have been used. 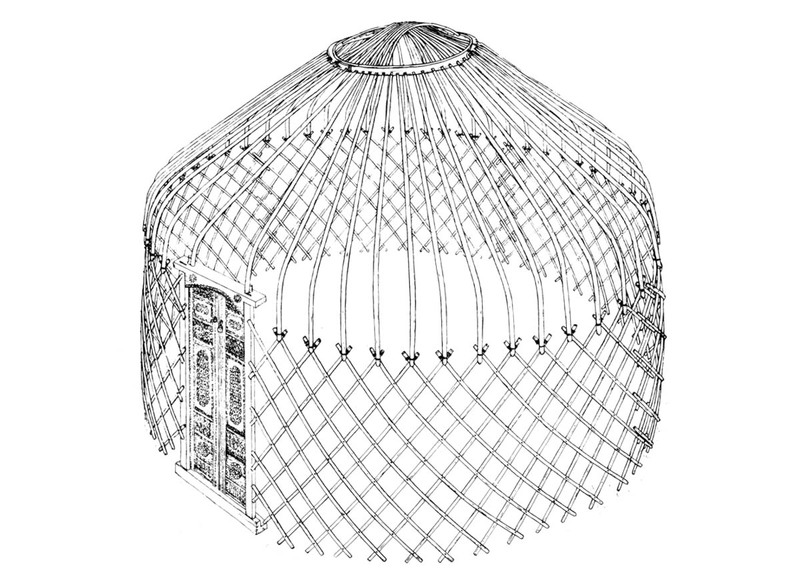 There are several varieties of Yurt and all share the essential circular shape, trellis walls, and roof poles radiating from a central roof wheel. Traditionally yurts were covered in hides or woollen felt covers from the sheep herded by the nomadic tribal shepards. Although felt alone is only suitable in dry climates, canvas covers were only developed in more recent times. The frames were made of the coppiced willow, this was found at lower altitudes and was a vital resource for the nomadic clans and diverse tribal groups. The designs incorporated within traditional Yurts reflect the deeply diverse spiritual and cultural influences which stretch across the vast and fascinating region in which Yurts are found. From Buddhist symbols, to Taoist sages to animist shamanic spiritual contexts, all found their place in the diversity of the tribal cultures assimilated into the nomadic life of the Yurt dwellers. 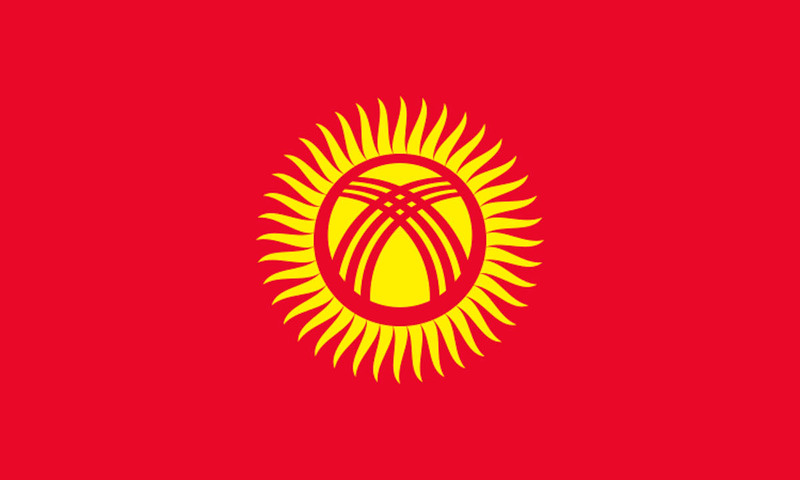 The Yurt has immense cultural significance in Central Asia and features on the national flags of Kyrgyzstan and Kazakhstan. The Yurts ancient design has expanded throughout the centuries due to its immensely practical nature. The harsh climate of the Asian steppes required a shelter that was stable in strong winds, easily insulated, portable, solid and easily erected. The Yurt had all these characteristics, as well as being protective and secure with its solid trellis walls, an important feature for the tribal cultures of Central Asia. This explains the Yurts complete adaptability to the modern Western cultural context, where it has become totally at home. The tradition of UK Yurt manufacturers has evolved from the Turkic-inspired steamed bentwood willow Yurts into its own tradition, using English hardwoods and sawn timber. Through the work of UK Yurt pioneers such as HalWyn Jones, UK Yurt making is now a tradition in itself. As the design of the Yurt met with the green woodworking and coppicing traditions at the heart of the UK's rural woodland crafts, a new Yurt tradition was born. Due to the rigours of the wet Northern European climate, European Yurts have evolved using canvas as the main covering as opposed to felt, which is used purely for its insulative qualities as a second interior layer, sometimes hidden by an extra internal cover. 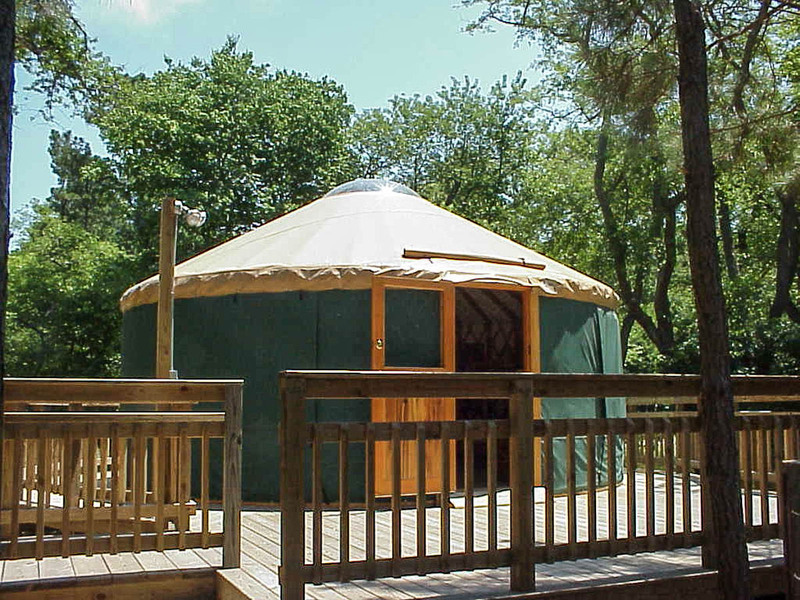 The contemporary Yurts manufactured primarily in the United States are more Yurt-derived permanent structures which have incorporated the most recent developments in synthetic fabrics and insulation. The American adaptation of yurts into the modern era has produced some of the most permanent examples of truly modern Yurt-derived homes, although often without the portability of their European cousins. Through the ground-breaking work of Yurt-makers such as the late Bill Copperwaite and the commercial savvy of US entrepreneurs, Yurts have now established a firm foothold in the western world.